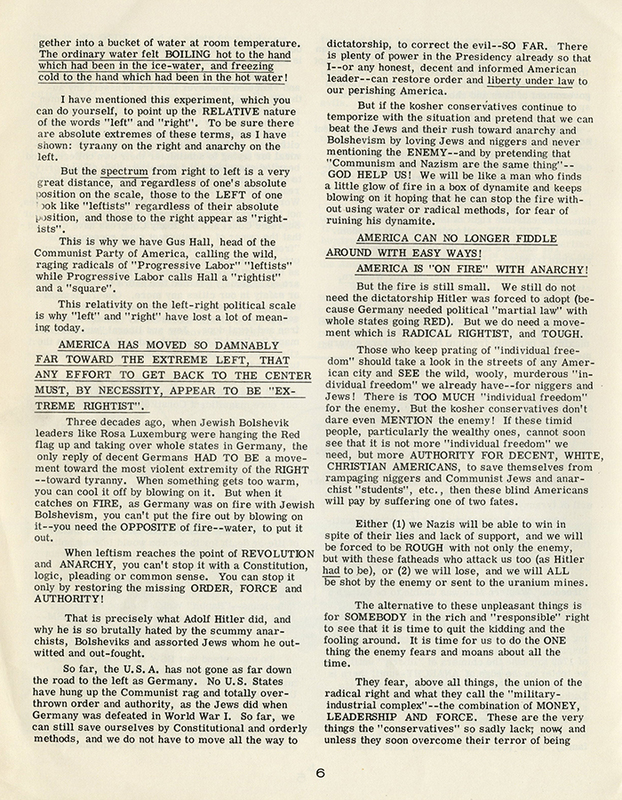 Official monthly publication of the American Nazi Party, an organization founded by George Lincoln Rockwell in March 1959. 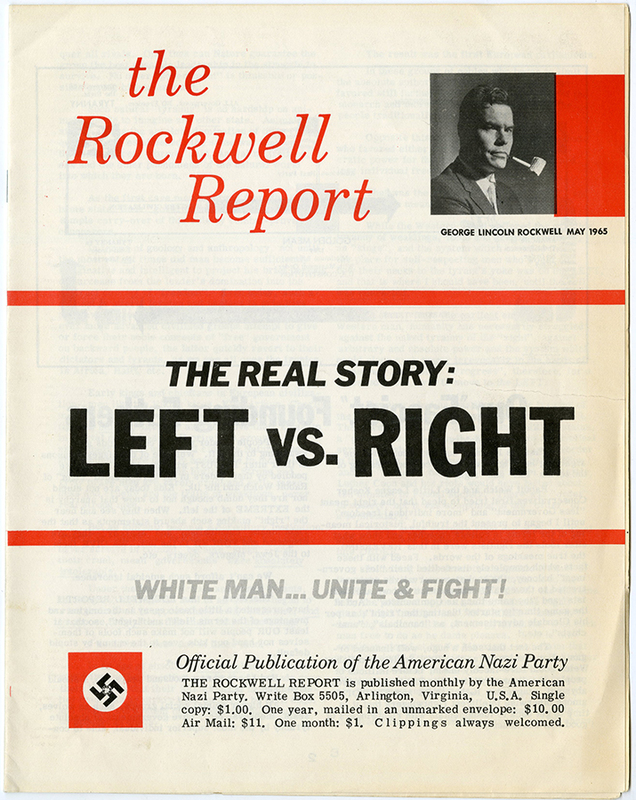 Cover title for this issue, "The Real Story: Left vs. Right." Slogan on cover: "White People! Unite & Fight!" 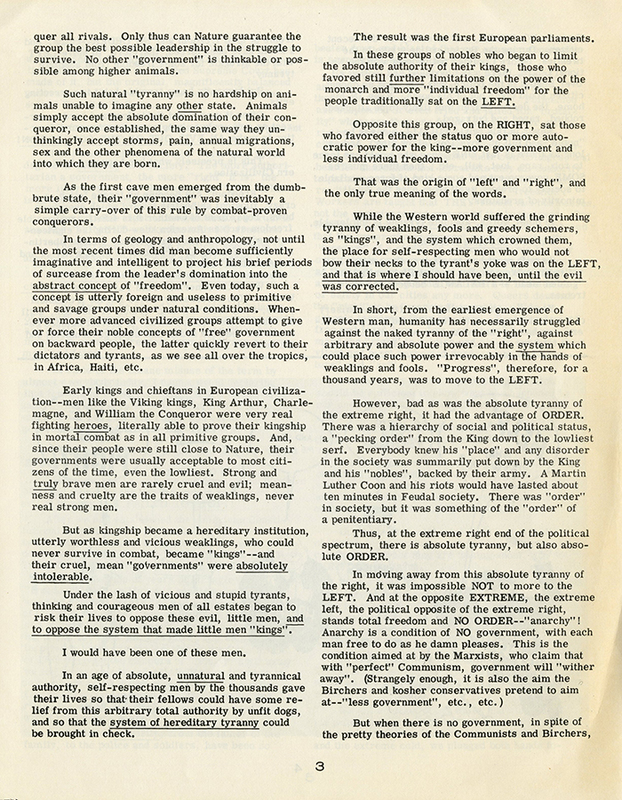 Article by George Lincoln Rockwell entitled, "Our 'Fascist' Founding Fathers" argues that the American Nazi Party represents a GOLDEN MEAN between the Tyranny of Total Order on the Right and the Anarchy of Total Freedom on the Left. 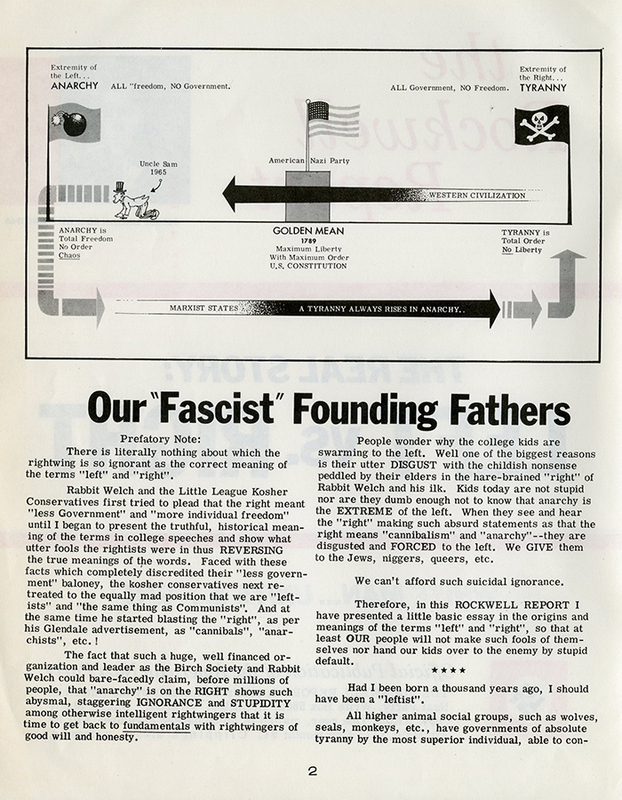 Rockwell rails against "Rabbit" Welch (Robert W. Welch, Jr.), the founder of the John Birch Society. (Welch promoted conspiracy theories, including the notion that President Dwight D. Eisenhower was secretly a Communist.) 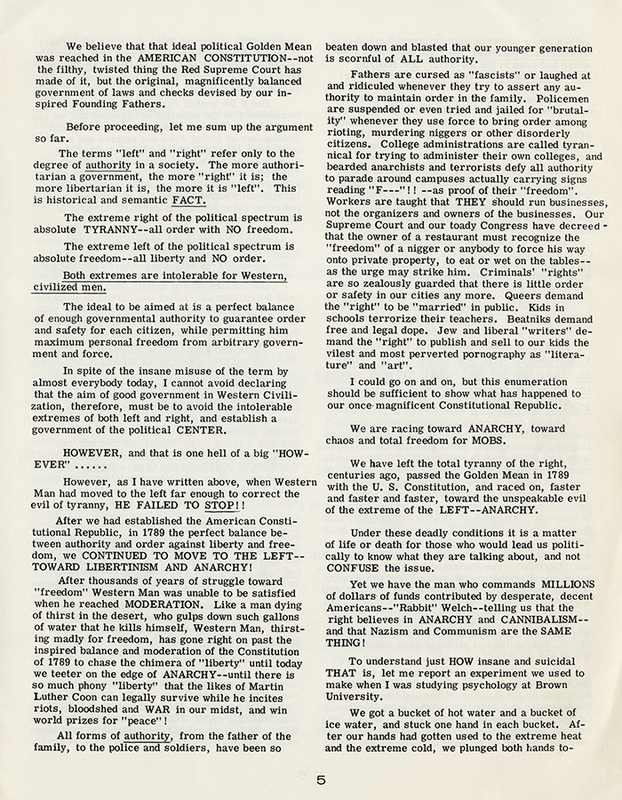 Rockwell is incensed that Welch has equated Communism and Nazism. 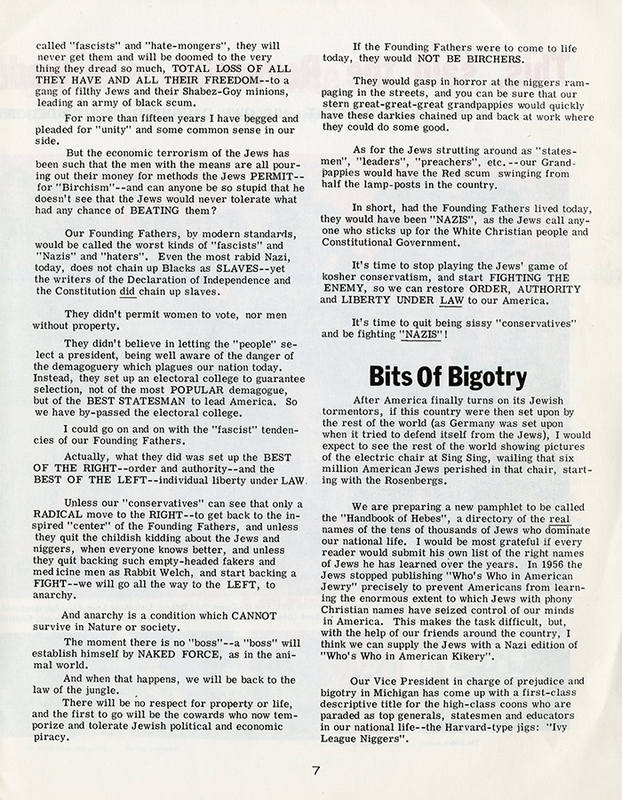 p.7 "If the Founding Fathers were to come to life today, they would NOT BE BIRCHERS....had the Founding Fathers lived today, they would have been 'NAZIS', as the Jews call anyone who sticks up for the White Christain eople and Constitutional Government." The shadow of an assassinated American Nazi commander hangs over Charlottesville. The Washington Post (August 21, 2017). 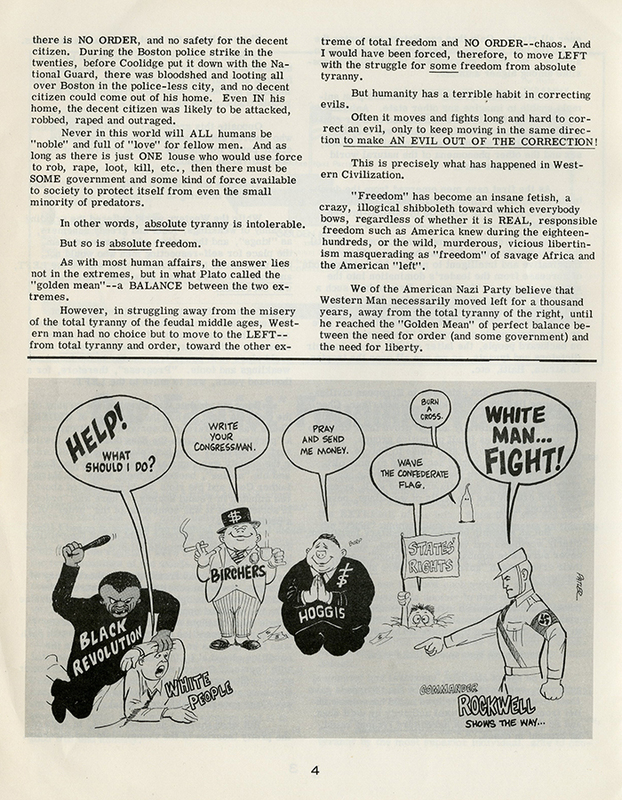 “The Rockwell Report, May 1965 [American Nazi Party],” Social Welfare History Image Portal, accessed April 26, 2019, https://images.socialwelfare.library.vcu.edu/items/show/297.